It was a nice apartment. 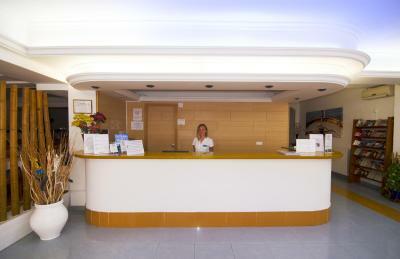 The front desk staff was there for check-in. Had to go next door for the check in and key. There isn’t much open on Sunday. All the local businesses close Sunday. The airport is near the hotel. 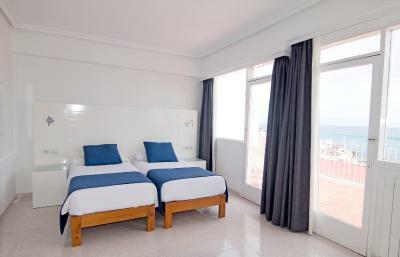 The hotel is situated in an EXCELLENT location, just footsteps away from the beach. 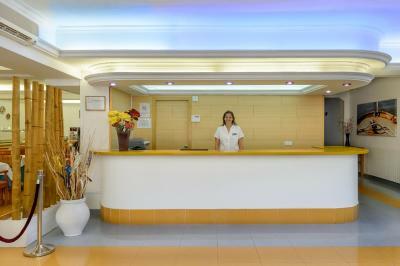 The front desk staff was excellent, warm, welcoming, and friendly. This hotel is a great value for what it is, but I will definitely be spending a little more for a more comfortable experience next time. 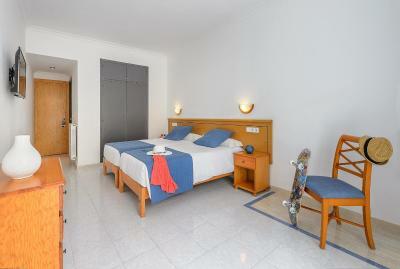 Beds were the best, you are 50 m from beach and next to taxi station and near center. We liked big fridge in the room. Staff is very friendly and helpful. Location os good, just in front of taxi stop. Overall the hotel is good value. If not for the unexpected room mate I would go back. 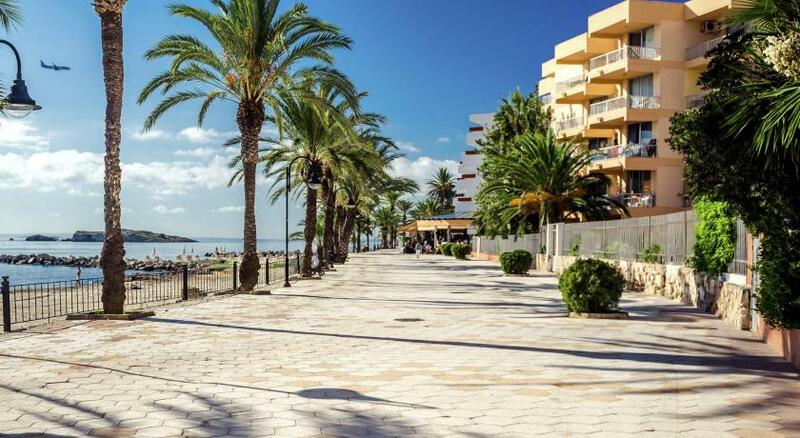 The hotel is located very close to a beach. 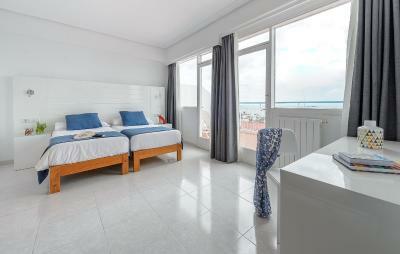 The rooms were clean and the staff was friendly and spoke english. Alright for the price. Big breakfast buffet that only misses a good yoghurt and muesli. 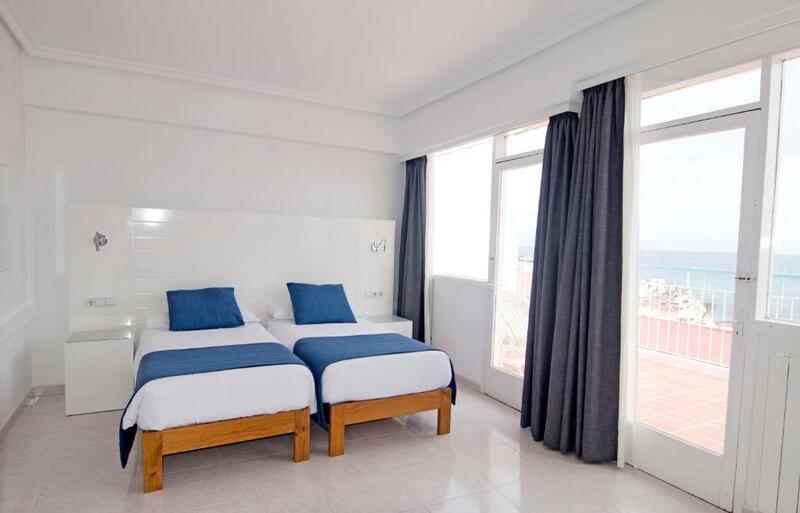 Hotel Central Playa This rating is a reflection of how the property compares to the industry standard when it comes to price, facilities and services available. It's based on a self-evaluation by the property. Use this rating to help choose your stay! One of our best sellers in Ibiza Town! 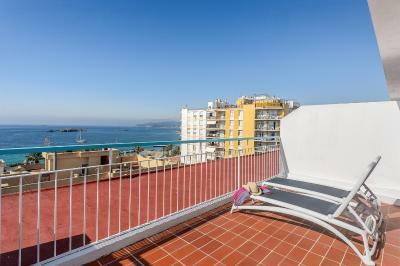 Central Playa Hotel features a small rooftop pool and terrace, with free sunbeds and stunning sea views. 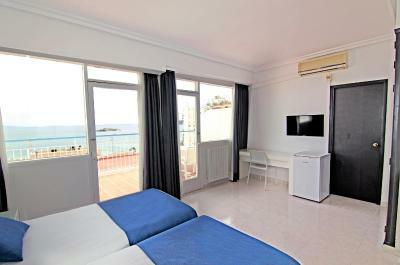 Located next to Figueretas Beach, it is 0.6 mi from historic Ibiza Town. 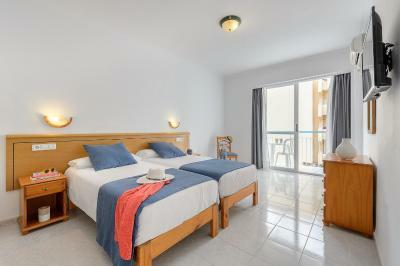 The Central Playa offers functional, air-conditioned rooms with satellite TV. 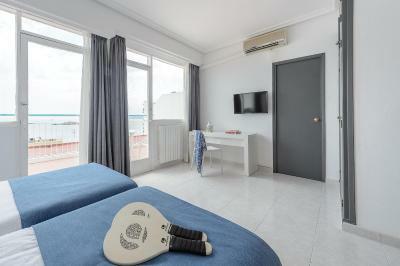 Rooms include a mini fridge and a private bathroom. Free WiFi is available. Hotel Central Playa serves a buffet breakfast. The hotel also has a TV lounge with a pool table. 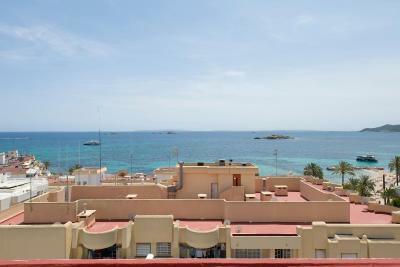 The hotel is a 15-minute walk from central Ibiza Town, and just 10 minutes’ walk from the port area. Many famous nightclubs, including Space, Amnesia and Pachá are a short drive away by taxi or the island’s Disco bus. 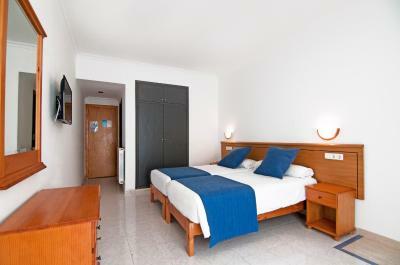 When would you like to stay at Hotel Central Playa? This comfortable, air-conditioned room includes satellite TV, telephone, mini-fridge, a free safety deposit box and private bathroom. Free WiFi is available. 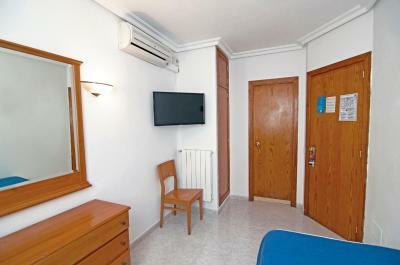 This triple room features satellite TV, a free safety deposit box and air conditioning. Free WiFi is available. 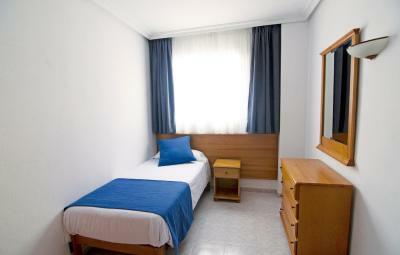 This single room features air conditioning and a free safety deposit box. Free WiFi is available. 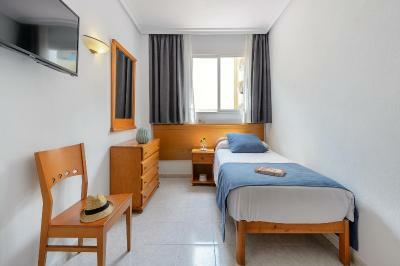 This twin room has a balcony and air conditioning and a free safety deposit box. Free WiFi is available. Have a blast, don’t stop and relax. This is the ideal place to spend your holidays partying. You will be able to enjoy the night life you that you are looking for whilst also relaxing. 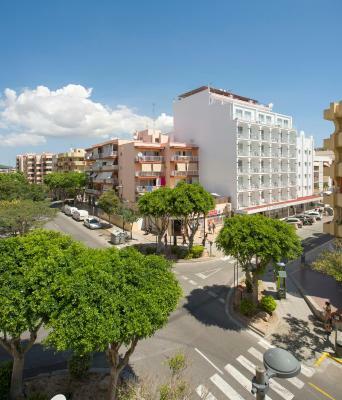 Our location, services and facilities are focused on offering you the opportunity to experiment the vibrant city of Ibiza and its famous nightlife. Ibiza Town has graceful architecture, excellent dining – and of course some of Europe's best places for clubbing and going out. Dance the night away! House Rules Hotel Central Playa takes special requests – add in the next step! Hotel Central Playa accepts these cards and reserves the right to temporarily hold an amount prior to arrival. Please note that reservations are paid on arrival, except for nonrefundable rates which are paid at the time of booking. In the event of early departure, guests should notify the property at least 72 hours in advance, otherwise the hotel will charge an additional 2 nights' fee. The location is excellent: No. 10 bus from airport stops 3 mins away, 50m from the sea (although that access was closed due to building works when we were there) and minutes walking from main street. Bus station, old town and marina also within easy walking distance. Full sized fridge in bedroom. Right next to Spar supermarket. Small swimming pool and sun loungers on hotel roof. Recycling facilities on each floor. I paid for superior room. I don’t think I got it initially. Photos on Booking.com didn’t match the see view I had from my room. It was very disappointing. Excellent hotel for 2 stars. Friendly and breakfast was godd. Great value for the money you pay. Absolutely perfect customer service! Clean and tidy and good value for money. Should have a better star rating.. breakfast is great with a good choice. 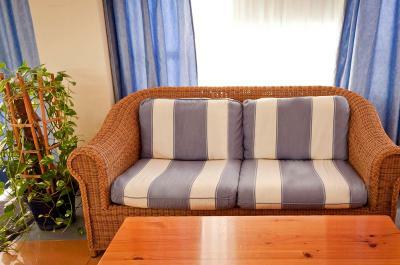 Location is excellent and staff are very friendly with very clean facilities. Was cold in the room. Only one elevator for the seven floor building. The beach near the hotel was closed for renovation. The staff was exceptionally kind and accommodating. Location is close to the old town, you can go By foot. We Are very satisfied. Breakfast was very delicious! Breakfast was brilliant! Great choice and great value for money. Staff very helpful and friendly.